We like to call Parker Solar Probe the coolest, hottest, fastest mission under the Sun — and fall 2018 will prove why. Here are a few mission milestones to look forward to over the coming months. Oct. 3, 2018 (about 4:45 a.m. EDT) — Parker Solar Probe performs its first Venus gravity assist. This maneuver — to be repeated six more times over the lifetime of the mission — will change Parker Solar Probe’s trajectory to take the spacecraft closer to the Sun. Oct. 29, 2018 — Parker Solar Probe is expected to come within 27 million miles of the Sun. This is the record currently held by Helios 2, set in 1976. Oct. 30, 2018 — Parker Solar Probe is expected to surpass a heliocentric speed of 153,454 miles per hour. This is the record for fastest spacecraft measured relative to the Sun, set by Helios 2 in 1976. These speed and distance estimates could change after Parker Solar Probe performs its Venus gravity assist on Oct. 3. Oct. 31 – Nov. 11, 2018 — Parker Solar Probe performs its first solar encounter. Throughout this period, the spacecraft will gather valuable science data. It will not be in contact with Earth because of the Sun’s interference and the orientation needed to keep the spacecraft’s heat shield between it and the Sun. The spacecraft is expected to reach its closest approach on Nov. 5. Like the distance and speed records, this estimate could change after the Venus gravity assist. 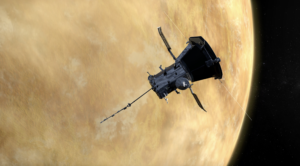 December 2018 — Parker Solar Probe will downlink the science data gathered during its first solar encounter. You can keep up with Parker Solar Probe’s real-time speed and position online, with updates every hour. More mission milestones are also available. Editor’s note: This post was updated on Oct. 3, 2018, to correct the expected date of first perihelion.